A CD duplication company provides a number of services. Irrespective of whether you are a business person, musician or in some other profession, you will equally benefit by getting quality disc, packaging and print products from a CD duplication company. It is an extremely cost effective way to get CDs duplicated in a very short time frame from a popular CD duplication company. If you require hundreds of CDs duplicated at one time or a small handful of discs, it is surely best to opt for a CD duplication company. Many people get mystified between CD duplication and CD replication. However, both are completely different from each other. 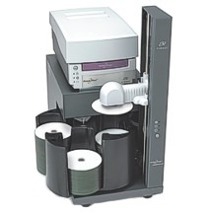 CD duplication is a process in which data from one CD is copied to other. CD replication is a manufacturing process in which every CD is injection-molded with the help of polycarbonate pellets into its finished shape and size. Furthermore, it is physically stamped with data. As replicated discs are most durable and of the highest quality, you will require a minimum order because the manufacturing and set-up costs involved are quite high. Due to having no minimum order requirement, CD duplication is truly the finest solution for smaller runs of CDs or DVDs. At the time when duplicated discs initially became famous, they were not very popular due to their inferior appearance and quality compared with large volumes of replicated orders. So, if you wish to duplicate a few CDs, then it is best to go for CD duplication rather than opt for CD replication. This entry was posted on Saturday, March 21st, 2009 at 12:02 pm	and is filed under CD Duplication Articles, CD Replication Articles.